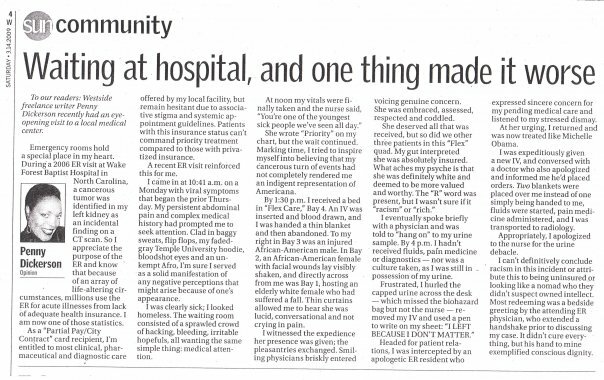 To our readers: Westside freelance writer Penny Dickerson recently had an eye-opening visit to a local medical center. Emergency rooms hold a special place in my heart. During a 2006 ER visit at Wake Forest Baptist Hospital in North Carolina, a cancerous tumor was identified in my left kidney as an incidental finding on a CT scan. So I appreciate the purpose of the ER and know that because of an array of life-altering circumstances, millions use the ER for acute illnesses from lack of adequate health insurance. I am now one of those statistics. As a “Partial Pay/City Contract” card recipient, I’m entitled to most clinical, pharmaceutical and diagnostic care offered by my local facility, but remain hesitant due to associative stigma and systemic appointment guidelines. Patients with this insurance status can’t command priority treatment compared to those with privatized insurance. A recent ER visit reinforced this for me. I came in at 10:41 a.m. on a Monday with viral symptoms that began the prior Thursday. My persistent abdominal pain and complex medical history had prompted me to seek attention. Clad in baggy sweats, flip flops, my faded-gray Temple University hoodie, bloodshot eyes and an unkempt Afro, I’m sure I served as a solid manifestation of any negative perceptions that might arise because of one’s appearance. I was clearly sick; I looked homeless. The waiting room consisted of a sprawled crowd of hacking, bleeding, irritable hopefuls, all wanting the same simple thing: medical attention. She wrote “Priority” on my chart, but the wait continued. Marking time, I tried to inspire myself into believing that my cancerous turn of events had not completely rendered me an indigent representation of Americana. By 1:30 p.m. I received a bed in “Flex Care,” Bay 4. An IV was inserted and blood drawn, and I was handed a thin blanket and then abandoned. To my right in Bay 3 was an injured African-American male. In Bay 2, an African-American female with facial wounds lay visibly shaken, and directly across from me was Bay 1, hosting an elderly white female who had suffered a fall. Thin curtains allowed me to hear she was lucid, conversational and not crying in pain. I witnessed the expedience her presence was given; the pleasantries exchanged. Smiling physicians briskly entered voicing genuine concern. She was embraced, assessed, respected and coddled. I eventually spoke briefly with a physician and was told to “hang on” to my urine sample. By 4 p.m. I hadn’t received fluids, pain medicine or diagnostics – nor was a culture taken, as I was still in possession of my urine. Headed for patient relations, I was intercepted by an apologetic ER resident who expressed sincere concern for my pending medical care and listened to my stressed dismay. At her urging, I returned and was now treated like Michelle Obama. I was expeditiously given a new IV, and conversed with a doctor who also apologized and informed me he’d placed orders. Two blankets were placed over me instead of one simply being handed to me, fluids were started, pain medicine administered, and I was transported to radiology. Appropriately, I apologized to the nurse for the urine debacle. I can’t definitively conclude racism in this incident or attribute this to being uninsured or looking like a nomad who they didn’t suspect owned intellect. Most redeeming was a bedside greeting by the attending ER physician, who extended a handshake prior to discussing my case. It didn’t cure everything, but his hand to mine exemplified conscious dignity. I wish I could tell you that your situation was isolated but, it isn’t. Further, it may seem racially motivated because of the circumstance but I can also assure you that anglo-americans suffer the same treatment. Three years ago, I experienced this type of treatment with my wife. My wife is the light of my life and to see her laying in pain with a gall bladder attack and no one paying any attention because of our health care status was unconscionable. We have both been small business owners contributing to the tax base of our country and investing in the economy but not a large enough business to afford complete health care. I, like you, had to rage against the situation before anyone cared. I know some people are looking for an entitlement, I just want to be able to take care of my family without becoming a homeless statistic. I’m going to write a “Penny Post” inspired by your very poignant reply.